I WILL ATTEMPT to provide a brief respite from the current cold snap by talking about apples and reading from my two books, America’s Apple and Apples of New England, at 1 p.m. this Saturday, February 21, at the Hadley Garden Center, 285 Russell St. (Route 9), Hadley, Massachusetts. I will enlist a tray (or two) of warm apple crisp to aid me in this task. I will have with me copies of both books for sale and signing, and the New England Apple Association’s 2015 wall calendar, featuring orchard photography by Bar Lois Weeks and me. 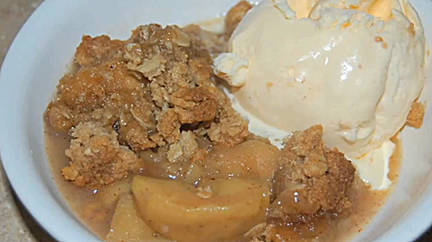 Here is the recipe for the apple crisp, along with its introduction from America’s Apple. We should have plenty on hand Saturday for post-talk refreshments. The event is free and open to the public. The forecast, of course, is for continued cold temperatures, and possibly some light snow, but (hopefully) not enough to keep everyone home. A fresh apple pie is a thing of beauty: delicious, substantial, and versatile — elegant enough for a dinner party, familiar enough for breakfast the next morning. When you do not have time to roll out a flaky crust to encircle your gently spiced apple filling, apple crisp is the next best thing. Apple crisp has all the good apple stuff that goes into a pie, with a rich, crunchy topping. There are many variations, such as adding other fruits like cranberries, raisins, or pears, or in the topping (one recipe uses graham crackers rather than flour). Here is one of my favorites, passed down through the generations from Lois Castell Browns, grandmother of photographer Bar Lois Weeks. Bar substituted whole wheat flour to make it healthier than the original . Preheat oven to 350˚. Core and slice apples into a buttered 8” square pan. Sprinkle lemon juice and spices over the apples. Combine topping ingredients to cover the apples. Bake for 45 minutes or until apples have softened. Next up: South Hadley Library, South Hadley, Massachusetts, Wednesday, March 25, at 6:30 p.m.